It was a painful year for Atlético Madrid. The second top goalscorer in the league, Jimmy Floyd Hasselbaink, belonged to the team second from bottom. Ranieri was dismissed after matchday 26 with the club in administration due to accumulated debts, Radomir Antić took over a squad that was already in a tailspin, sitting in 17th league spot and barely hovering above relegation zone. The team fell into the relegation zone and never came back, they were eliminated from the UEFA Cup in the quarterfinals by Lens, and Antić was fired after matchday 37 after Atlético was already mathematically relegated - the team actually had to bring in a new manager, Fernando Zambrano, for the last match. And even making the Copa del Rey final for the second consecutive season didn't paper over the cracks - Espanyol beat them to that trophy. As many players left and Atlético struggled to assemble a squad, Fernando Zambrano, who had started his managerial career in Rayo's youth teams, brought in three players from the club. Left-back Carlos Llorens was a late bloomer. He had to wait until the age of 26 to make his professional debut, in the second division with Lleida in 1995, after having played for Tomelloso, Cartagena, Elche and Levante. He scored 10 goals for Leganés in the 1997-98 season, and helped Rayo gain promotion to La Liga the season after. For the penalty-kick specialist, a long and arduous journey to La Liga was coming to its final stop on the verge of turning 30. That La Liga debut was a 2-0 win at, oddly enough, Atlético Madrid. With Jesús Gil in charge, things were always going to be turbulent at Atlético. Zambrano got off to a rough start in 2000-01 and was sacked after just five games, and the three players (Llorens, Iván Amaya and Jean-François Hernandez) who joined him from Rayo immediately saw their futures thrown into doubt. Llorens played 12 of the first 13 league games but jumped at the chance to leave, signing for Osasuna in La Liga after six months. And after stints at Alavés in La Liga and Poli Ejido in the Segunda, he ended up having a second stint at the club he loved - Rayo - which he joined at the age of 37 in the Segunda B. It would be where he retired three years later, even helping them get out of the Segunda B. 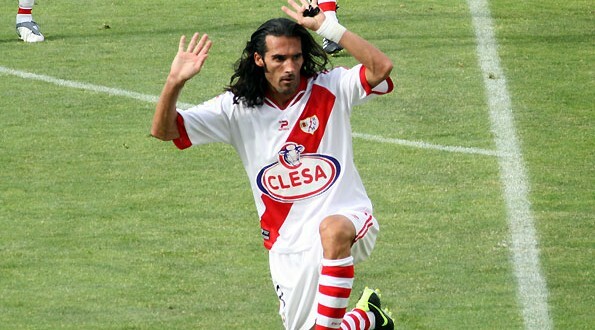 He is the second oldest goalscorer in the Segunda - 4th if you count both La Liga and the Segunda. And he achieved it with the club he may have left unceremoniously but retired at gratifyingly.